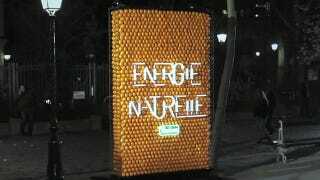 Orange You Glad Advertising's Going Eco-Friendly? For Tropicana juice's latest ad campaign, they went back to basics and filled billboards with hundreds of oranges, the acid of which generated enough electricity to light up the billboard. You can keep up with Kat Hannaford, the author of this post, on Twitter or Facebook.